What is the symbol on Konohamaru's sleeve? 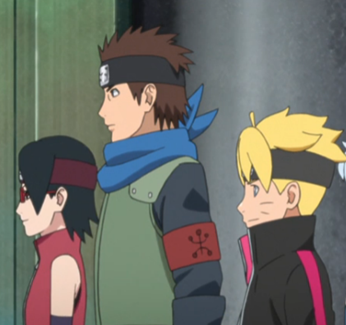 In Boruto, Konohamaru has a symbol on a band on his sleeve. It looks a bit like the USB symbol (or a cross between a stick figure and a salamander), though obviously that's not what it is. What is it and what does it represent? That is the symbol of the Sarutobi Clan of which he is a member. Not the answer you're looking for? Browse other questions tagged boruto or ask your own question. Why was it so easy to defeat Toneri, Kinshiki and Momoshiki? Does Boruto have Sasuke's headband? What would happen to the offspring of a Sharingan user and a Byakugan user? What was the red (rasengan type) thing Boruto's giant rasengan collided with, while attacking Momoshki? Can Boruto really use water style? Can 2 elements be combined into a new release without a “clan based Kekkai Genkai”? What is the icy humanoid creature? What clan is Kawaki from? What happened to Metal Lee's Mother?